Today I'm sharing five of my favourite products for curly hair, some I've recently discovered others I've used for a long time and keep going back to. For anyone with curls that need to be kept in line, these five are definitely worth a try. I've been using this for years, it's really one of the nicest leave in conditioners I've ever used. It's sort of a balm rather than a cream and you don't need much. I just use it on the middle part of my hair and comb through to the ends. Its got a glorious smell and leaves your hair very soft but not heavy. I've noticed in the shops recently that this isn't the most up to date packaging, its different now but I did a bulk buy a while back which is why I'm still working my way through this one! I buy mine in Sainsburys and Boots and of course, its on the shelf with all the other Charles Worthington products. 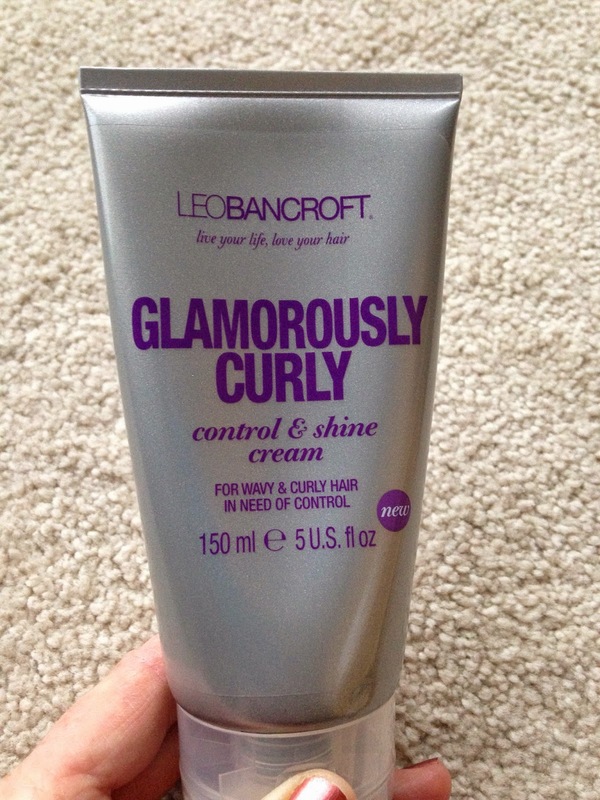 When I first bought this I didn't actually know who Leo Bancroft was, I had to look him up! I haven't seen this in any other shop than Tescos but I am sure its available in other places and online. Fantastic for frizz, it doesn't have a particularly strong hold (i.e. 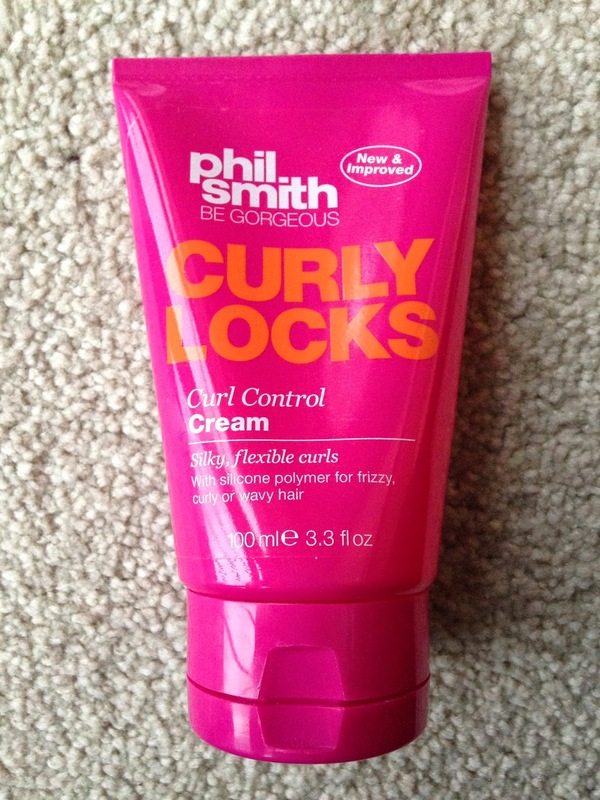 curl hold) but definitely tames waves and curls and lasts all day with the bonus of a nice smell too. I reviewed this a while back which you can read here it was actually my January favourite, but 6 months on it is still my most favourite shampoo and one of the few that does seem to control my hair. The one pictured is for dry and damaged hair, quite often I'll get another one in the Pantene range which I think is for frizz control but either one of them is great. I do find the conditioners quite heavy so I don't use those, I just stick to the shampoo and a leave in conditioner. I've already done a review on this product this year which you can read here but suffice to say this is still one of my favourites and always has a place on my dressing table. Its also great to take on holiday as it does have a frizz control element which I really need for heat, damp and humidity! 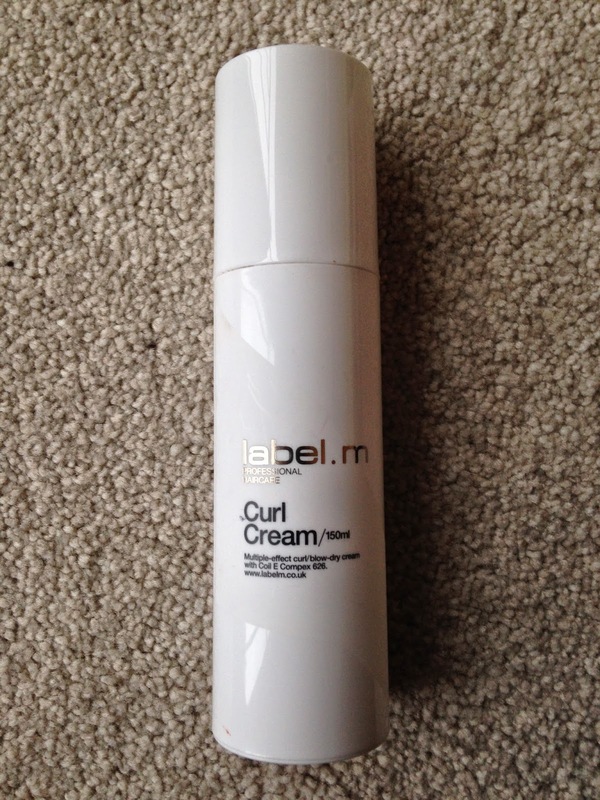 I totally love this product, I've been using Label M Curl Cream for a long time now, ever since I started having my hair cut at Toni & Guy as they stock Label M products and recommended it. The cream is quite sticky (but mainly one your hands not on your hair), once its dry you get a brilliant well defined curl hold which lasts all day. I buy this from the Look Fantastic website now, its about £11 which is quite pricey but it does last for a long time because you really don't need very much. I've also recently discovered the Label M Protein Spray which I will review separately once I've finished testing it, but so far so good! We use a lot of hand soap in our house, it has to be said. 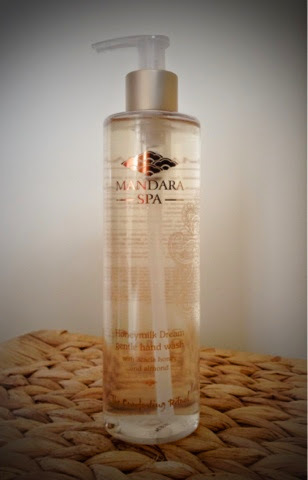 I'm always on the look out for nice hand soaps and my most recent find is this one from Mandara Spa, I have to give my sister credit for this find, I've spent a lot of time at her house lately with her new baby twins and washed my hands a lot! I absolutely love this soap. Its beautiful fragrance consists of acacia honey and almond and lingers on your hands long after you've dried them. Its elegant packaging does not look out of place in an ensuite bathroom or downstairs cloakroom. Alas, my own cloakroom is continually filled with small grubby handed boys who need to get mud/felt tip pen/chocolate/general boy germs off their hands, so this lovely soap is completely wasted on them which is why I've put it in my own bathroom just for me to use and they can continue to use the no-nonsense, anti-bacterial stuff! Mandara Spa Honeymilk Dream can be purchased from Sainsbury's for £4.00. There are two other fragrances to choose from but this is my favourite. Hi beautiful people, this post is a replacement for my Beauty Aware Weekly Round Up, its become clear to me that I can't commit to a weekly post, as I've got too many other things going on that I have to prioritise, and things that get in the way of blogging (annoying though this is). So I've been thinking about it and I've decided to change the title a bit, so its still a summary of the beauty bits and bobs of my week but isn't necessarily "weekly" and then I won't feel rubbish for not posting if I can't get round to it! So, this week I've been loving my new Barry M nail varnish. Now, this is a nail polish with a difference for me, because its not coral, red, or pastel shimmery pink. Its a Barry M Gelly Hi Shine in a lovely lavender colour and its called "Prickly Pear" which I thought was a cute name. Not my usual go to (not sure why) but then, it was an impulse buy in the queue at Superdrug (as you do), on sale so I got this one and a deep fuschia which I've yet to try. I'm trying to remember the last time I had anything from Barry M, it was a while ago for sure. I'm really impressed with this one, I love the colour and its pretty hard wearing, only a couple of chips and they were barely noticeable. I put on two coats for longevity but one coat and a clear top coat would have been just as pretty as its such a lovely summery colour. Another purchase this week was a MAC lipstick, I've been dithering for ages about this because I wanted a new MAC lipstick but wasn't sure what colour to get. I've been avidly reading blog after blog review and Cockney Red seemed to pop up quite a lot, plus its quite a strong colour and that's what I was after. 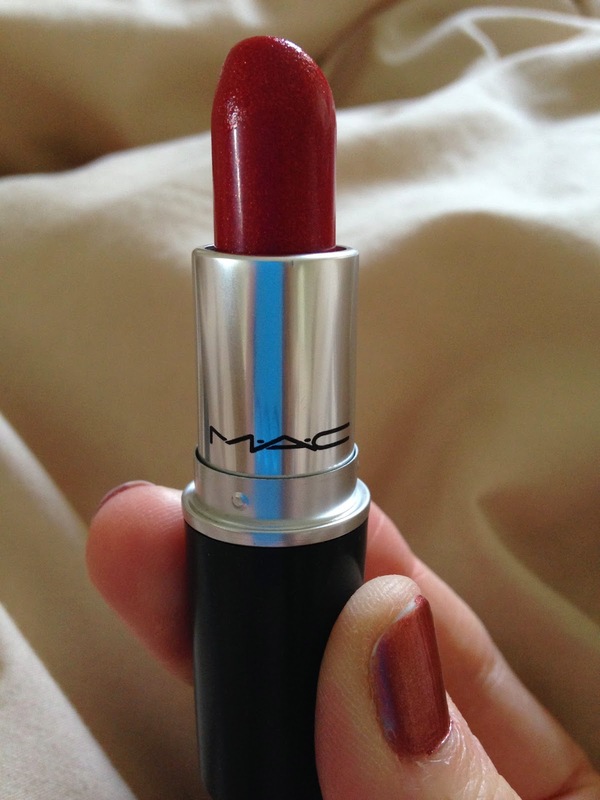 Its very creamy and moisturising but not particularly long lasting, at least not for me, I tend to have to reapply a fair bit but I don't mind because it is such a lovely lipstick. (The colour on my nails in the photo is Maybelline Color Show in Brick Shimmer). My July GlossyBox was dispatched on Friday so should be here Monday or Tuesday, this will be my second month of receiving this particular parcel of goodies, I've no idea what will be in it, hopefully it will be as good as last month. It was my birthday on Wednesday and among several lovely presents was a bottle of Chanel Chance from my husband. I love Chanel perfume but never buy it for myself so I was really pleased to receive it. Hubs took the day off work and we went holiday shopping and out for lunch which was really nice as we're hardly ever by ourselves but all the boys were at school so it was nice to escape for a few hours! We're off to Florida in August with the boys and I needed a swimsuit so I went to M&S and got two really nice ones in the sale (well worth a look in my opinion, there's all sorts of nice stuff that has been reduced). These are the two that I bought, they aren't particularly glamorous but I was after something fairly functional as I'll be in the pool and sea with the boys so I know these aren't going to be everybodys cup of tea, BUT there are others in the M&S range that were less "Mummy" and some really lovely bikinis (in all sizes, including very small and very large which I was pleased to see!). I've taken a photo of me in one of the swimsuits so you can see what it looks like on. I'm quite tall (5ft 9) and a size 14 and as you can see, not a twiglet (lol), I deliberately chose ones with "tummy assistance" and a flattering ruched front and as you can see in the photo, these are standard leg, not high leg, I stayed away from high as I don't want my bum accidentally falling out in the kids pool! The bra cups are slightly padded and shaped, I liked this as I need help in that department and the straps are adjustable. I am SO getting a spray tan before my holiday! Finally, for all you L'Occitane fans out there I had an email the other day showing lots of lovely new products and free delivery for orders that include any of their award winning products (this ends 13th July). Also, L'Occitane are running a Summer Beach Party in their boutique stores between Tuesday 15th July and Thursday 17th July and you get a free gift of a cute pair of flip flops and a handcream if you spend over £35. For more information see the website www.uk.loccitane.com. What's in the June Glossybox? Hi beauty bloggers, my first post for a while as life's been a bit mad but I've been meaning to share the contents of my June Glossybox for a couple of weeks. There are five products in the box, have a look below and see what you think. For one reason or another I haven't tried them yet but they will be reviewed once I have. I'm particularly excited about the make up brush, its such a gorgeous brush. This is L'Oreal Volume Million Lashes Mascara in Black. This looks really nice, there have been so many good reviews of this mascara, its full size and RRPs at £10.99. I was really pleased that it was in the box, as you will know I'm normally a Max Factor mascara girl but I am excited to try this one. I'm a girl with very few make up brushes so I was delighted that this Beautiful Eyes Flat Stiff Brush by Teeez Trend Cosmetics, this is a full size brush, isn't it pretty? I can't wait to use it. 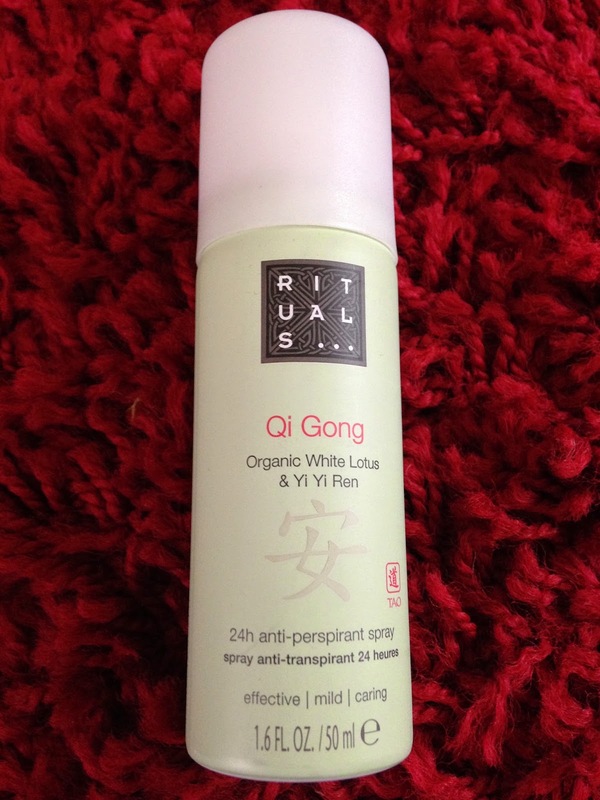 This is a Qi Gong anti-perspirant spray by Rituals (www.rituals.com), it smells yummy, more like a perfume than a deodorant. Its infused with white lotus and yi yi ren and lasts 24 hours. This is a concealer quad by So Susan Cosmetics (www.sosusan.com), as you can see its a cute quad palette with soft blendable colours, its for minor blemishes and imperfections. I stick with my Witch Hazel concealer normally so this will be great to try. 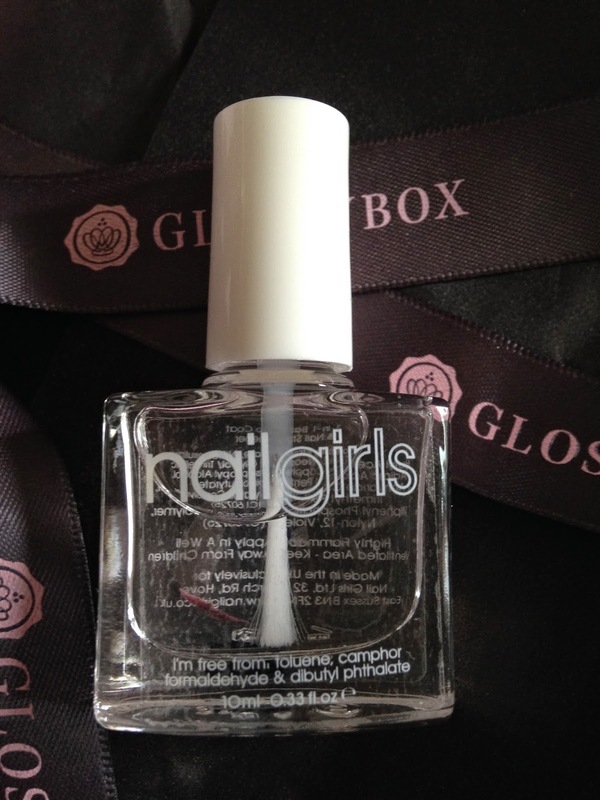 Finally, this is a base, top and nail strengthener from nailgirls (www.nailgirls.co.uk), I'm awful at remembering base and top coats and my nails are quite weak so another perfect product for me to try. In fact, I'm off to do my nails now, so I'll let you know how it goes! I'm thrilled with the June Glossybox and can't wait for the July box which should arrive next week according to the email they sent me yesterday. I'll review all of these products once I've tried them to let you know what I think.